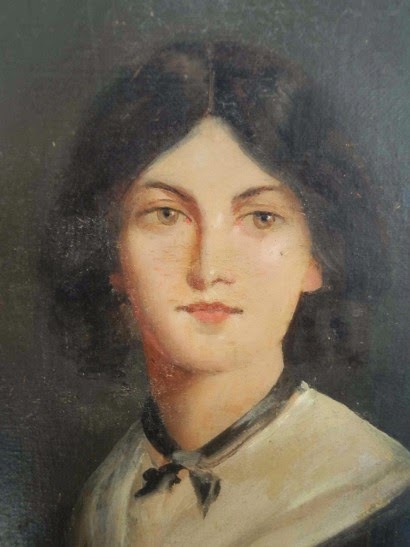 The novelist and poet, Emily Bronte, was born in Thornton, Yorkshire on July 30, 1818. The middle sister of the three famous Bronte girls, she was actually one of six Bronte children. After the death of their mother and two older sisters, Emily, Charlotte and Anne were taken from the school they were attending and were primarily homeschooled. After a series of moves, Emily ended up home in Haworth tending to her father and focusing, like her sisters, on writing. In 1845, Charlotte discovered manuscripts of poems that Emily had hidden away and was adamant that she have them published along with her and Anne’s. The girls collected their works into a volume called, Poems by Currer, Ellis and Acton Bell. Published in 1846 at the expense of the sisters, the volume sold only two copies. In 1847, Emily’s only novel, Wuthering Heights, was published just before her death in December 1848. "Madness" is a popular topic in 19th century literature. Society was beginning to see it as a medical issue and began dismissing the idea that insanity was what happened when one was possessed by an evil spirit. 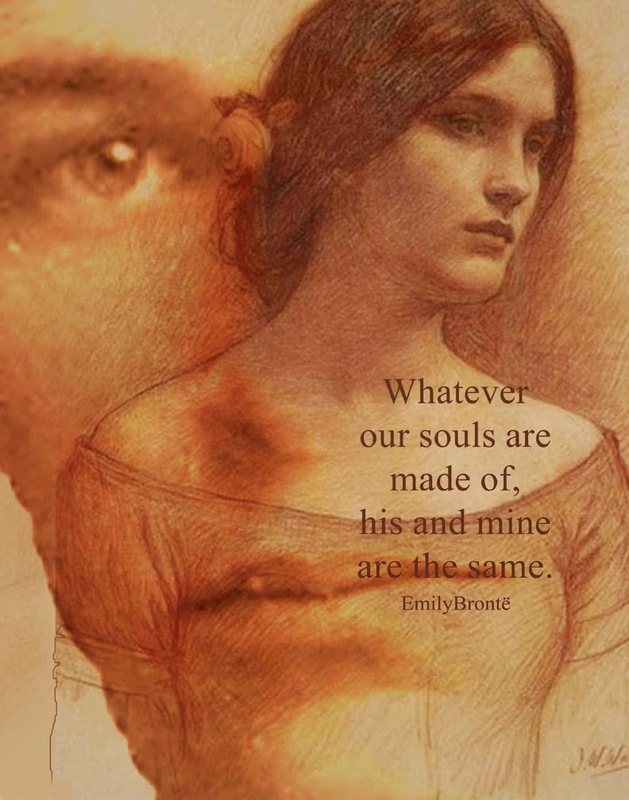 It has been said that Emily Bronte suffered from mental illness---madness, to those in her day. My own opinion is that many creative people are misunderstood by those who lack such wild imaginations---just throwing that out there to be on record in case my mental state is ever criticized 150 years from now! Nevertheless, literary historians have a lot to say about this one-hit-wonder whose single work, Wuthering Heights, (the most depressing and one of the most wonderful books I've read) has left such an impact on cultures worldwide. Author and Bronte critic, Daphne Merkin, discusses her death by saying, “the cause of her death was officially given as consumption, but it is clear to any reader of Emily’s biography that it was a form of passive suicide—that she had helped her end along by willing herself into the next world she so devoutly believed in”. This suggests that Bronte seemed to invite death to come to her; somewhat like her characters Catherine, and later Heathcliff, do in Wuthering Heights. It is possible that Wuthering Heights could have been intended to be biographical--surely it is prophetically so. More than one critic has drawn a comparison between the terrible Heathcliff and the almost-mad woman who created him. 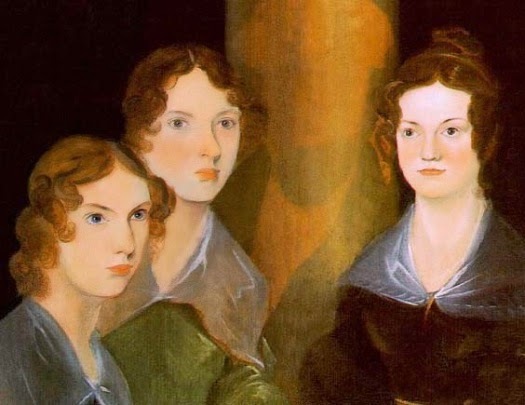 Romer Wilson, author of All Alone: The Life and Private History of Emily Bronte, when describing her as an author says, “Here appears, very early in her life, the creature who is destined to become, in time, the unregenerate, pagan, superstitious Heathcliff”. One critic, Edward Chitham, likens Emily, who is well-read and who takes care of the household chores, to Nelly, the housekeeper and co-narrator in the story. He points out the similarities in the two names: “Nelly”, a shortened version of “Ellen”, is close to Bronte’s pseudonym, “Ellis”. A third biographical suggestion is, in my opinion, a bit of a stretch. Katherine Frank, in her book, A Chainless Soul: A Life of Emily Bronte, argues that what critics have often seen as a strange mysticism surrounding the author’s personality, was really a hidden or misdiagnosed case of anorexia nervosa. Frank defines an anorexic as being, “overwhelmingly hungry, preoccupied with food, obsessed with power and control, and terrified of disorder”. She claims Emily was not free of these obsessions and asks, “How did it feel to be perpetually hungry and deny that hunger? Even more importantly, how was this physical hunger related to a more pervasive hunger in her life—hunger for power and experience, for love and happiness, fame and fortune and fulfillment?" I have a hard time concluding that these attributes that Frank ascribes to Bronte are definite evidence for only one ailment: anorexia. Granted, there are signs in the story that Catherine and Heathcliff may have both died of starvation, but I believe their reasons for starvation were not related to their body image, as anorexia often is, but instead to their utter desperateness for one another. While Frank does offer some sound evidence, writers are often known for their high-strung emotions and obsessive behaviors. It’s possible that she was just manifesting the eccentric behaviors and emotions that artist’s tend to exhibit. I also take issue with her claims of the “more pervasive hunger(s)”. If Bronte wanted experience, fame and fortune then why did she welcome death so readily? She’d just had her only two submitted works published and was on the road to these very dreams. There are several important themes that thread in and out of this relatively short gothic work. 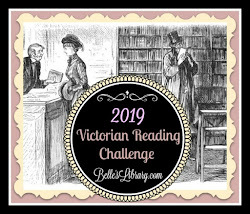 Bronte weaves in ideas about child abuse, patriarch-led families, social classes and the downfall of a woman who marries for money and not for love, among several other timeless matters. A central theme that I see as crucial to understanding both the story and it’s author is what Bronte calls “madness”. Discussion of and allusion to this ailment can be found in many, many places throughout Wuthering Heights and is especially obvious as it helps to accentuate the spiritual bond between Catherine and Heathcliff. Shortly into the story, Catherine makes a seemingly harmless statement that a reader unfamiliar to the entire tale would dismiss as an epithet of love. She is in the middle of chastising Nelly for suggesting that she and Heathcliff would be parted once she married Linton, when she utters probably the most famous line of the work, “Nelly, I am Heathcliff!” However, the deeper one gets into the story, the more one wonders if Catherine truly is mad and believes that they are one and the same soul—and if Heathcliff believes it as well. In Merkin’s introduction to the Barnes and Noble Classics edition she points out, “you choose whom you love, and, in the absence of genuine psychosis, you understand that for all your feelings of having stumbled onto your other half, you and your love object are not one and the same”. Nevertheless, over and over throughout the story, we see this theme of the two having the same restless soul. On what is to be the last night that Heathcliff and Catherine are together, Heathcliff is heartbroken over her imminent death and says, “Do I want to live? What kind of living will it be when you—oh, God! Would you like to live with your soul in the grave?” After Catherine dies, Heathcliff remarks to Nelly in anguish: “I cannot live without my life! I cannot live without my soul!” It’s obvious that both Catherine and Heathcliff literally believe that they share the same soul—a belief that eventually kills them both from anguish. Almost every character in the story displays mad behavior at one time or another. Hindley, in a drunken fit, demonstrates despicable behavior toward his son, Hareton, which can only be described as lunatic. He utters such horrible things about him such as, “he deserves flaying alive”, and “As sure as I’m living, I’ll break the brat’s neck”, before dropping him over a railing to what could have been his death had Heathcliff not been in the right place at the right time. Hareton displays madness at a young age as he hangs a litter of puppies from the back of a chair. Even young Linton acts crazy for attention, (like his aunt Catherine did on her death bed), when he throws himself to the ground in fits of convulsions in order to get his way. With all of this mad behavior going on, one cannot help but compare the characters in an attempt to discover the maddest of them all. Although I think that Heathcliff takes the cake over the long haul, beginning with his detestable behavior toward Isabella, his wife and "proxy in suffering", Catherine’s behavior is what really surprises me as I believe her fake madness, as alluded to in the previous paragraph, is what led to her early death. I think that Catherine’s demented behavior began as playacting to keep from having to answer Linton when he asks, “Will you give up Heathcliff hereafter, or will you give up me? It is impossible for you to be my friend and his at the same time; and I absolutely require to know which you choose”. It is at this time that Catherine begins exhibiting physical ailments, going from stamping her foot just a paragraph before, to dashing her head against the arm of the sofa, and grinding her teeth in the next. Even Nelly, the one who probably knows and understands Catherine the best, says that there was “nothing in the world the matter” and that Catherine had “resolved, previously to his coming, on exhibiting a fit of frenzy”. I think that Catherine is going to great lengths to keep from having to admit that she’d choose Heathcliff if it came right down to it. More than that, I think that her keeping to her bed and starving herself could be to keep herself from having to make the choice at all. The point eventually becomes moot when Heathcliff is no longer available to Catherine or a threat to Linton after he runs off with Isabella. When Nelly tells her that Linton has “no idea of your being deranged; and of course he does not fear that you will let yourself die of hunger,” Catherine is adamant that Nelly forward the message to him. “Persuade him!” She shouts. “Speak of your own mind: say that you are certain I will”. To her, this is a game. Catherine is animated and talking about things that Nelly calls insane. I would disagree that Catherine is not actually in possession of her faculties here, but either way, she’s making sense and speaking coherently. When Linton comes into the room, Catherine begins to act as if she doesn’t know him. “At first she gave him no glance of recognition: he was invisible to her abstracted gaze. The delirium was not fixed, however; having weaned her eyes from contemplating the outer darkness, by degrees she centered her attention on him, and discovered who it was that held her”. Catherine’s antics are best displayed in her last scene with Heathcliff. For several minutes, the two had been expressing their love and regret to one another, frantically trying to make up for lost time before Linton came home and before Catherine drew her last breath. Although the dialogue between the two is feverish and overly-emotional, it is still sane and understandable to anyone who may be eavesdropping. However, once Linton is heard coming toward the room, Catherine resolves herself to her biggest show of madness yet. She let her body go limp and seemed unresponsive as Edgar entered the room. Heathcliff played along by placing her in Linton’s arms and left the room. Catherine was “all bewildered,” and “sighed, moaned, and knew nobody”. It seems obvious to me that, like Bronte herself, Catherine took advantage of an ailment and let it consume her to past the point of returning. This, as I said before, could be seen as a prophetic destiny that Bronte may have not realized she was writing. Not only do Catherine and Heathcliff exhibit signs of the same sort of madness, they also present a clear picture of a true spiritual bond. Catherine, while on her death bed, calls to Heathcliff in her imagination and says, “I’ll not lie there by myself: they may bury me twelve feet deep, and throw the church down over me, but I won’t rest till you are with me. I never will!” The idea of death does not seem to bother her in the least: it’s the thought of death without Heathcliff that she can’t seem to bear. Years after Catherine’s death, Heathcliff describes a scene (which only affirms his madness) in which he goes to Catherine’s grave to exhume her body. As he’s attempting to pry the lid off her coffin, he hears sighing and could feel a “substantial body in the dark”, though he knew there was no one there. Where a perfectly sane person might find this whole situation odd and a little spooky, Heathcliff claims he was consoled because, “her presence was with me: it remained while I refilled the grave, and led me home”. Just before Heathcliff’s own death, the reader gets the impression that he has received some sort of message from Catherine that he is soon to die. He comes home on a couple of occasions with a strange smile on his face and a more peaceful countenance. He claims that everything connects them. The clouds, the trees, the night air, even the material that the flooring is made up of remind him of Catherine. He attempts to explain to Nelly that he senses a change coming but “shall not know that till it comes,” and says he is “only half conscious of it now." When it finally does come time for Heathcliff to die, it is hard to tell if he is in a state of madness or just one of extreme spiritualism. It seems that he, too, is suffering from a lack of food—just like Catherine did. Though there is no doubt in my mind that Catherine starved herself willingly and willfully, I can’t help but wonder if Heathcliff believes he is receiving the instructions to abstain from food from Catherine from beyond the grave. Nelly reports, “I vainly reminded him of his protracted abstinence from food: if he stirred to touch anything in compliance with my entreaties, if he stretched his hand out to get a piece of bread, his fingers clenched before they reached it, and remained on the table, forgetful of their aim”. In my opinion, this is a good sign that Heathcliff was fighting against his subconscious and willing himself to follow whatever instructions stopped him from grabbing the bread. Nelly affirms this a few pages later when she says, “I concealed the fact of his having swallowed nothing for four days, fearing it might lead to trouble, and then, I am persuaded, he did not abstain on purpose: it was the consequence of his strange illness, not the cause”. It's interesting that Heathcliff would experience the same sort of death as Catherine—and the madness that preceded it. The spiritual element to Wuthering Heights is concluded as Heathcliff joins Catherine to eternally haunt the moors and countryside after his death. The locals claim to have seen him and say that he had been near the church, on the moor, and inside a home. Even old, crotchety Joseph says he’s seen Heathcliff and Catherine together since their deaths. Nelly goes on to describe an instance where she comes across a little shepherd boy who is frightened of the apparitions he saw of Heathcliff and Catherine. The last line of the book leaves the reader with something to think on. Nelly is describing a peaceful time visiting the graves of Catherine, Heathcliff and Edgar. She describes the benign sky, the fluttering moths and the soft wind and wonders: “how anyone could ever imagine unquiet slumbers for the sleepers in that quiet earth”. Although I do not believe in the ability of a soul to “haunt” those left on earth after it’s body dies, for the purposes of fiction, I say, who could blame them? They’ve got a lot of time to make up for and a lot of unfinished business to take care of. Yes, we definitely see the spirit of oppression in Wuthering Heights. On the flip side, there's a beautiful hope of renewal at the end, as well! Oh, this was wonderful Sarah! I love this movie and I have tried to read the book and haven't ever finished it. It is too bad I saw the movie first. There is a lot of madness in it! You have done a great job describing it. I have never thought about them thinking they shared a soul, although they do seem to be soul mates. Thanks for joining HSH! Hi Sarah, I never read the book but saw the movie. I don't think I could read the book after that... To see other people suffer for a love they didn't have the courage to give in marriage to each other unsettled me... Perhaps it was just the movie version. Either way, your writing is excellent and I enjoyed reading this. Thank you also for joining in on the Art of Home-Making Mondays this week. I enjoyed reading your thoughts on this book! Thanks so much for sharing this at Booknificent Thursday at Mommynificent.com! Hope to see you again soon! I do love this book, though I find - your review is quite telling - that the book itself seems nearly to haunt me during and after each reading. The depravity...the madness to which characters give themselves over when they exercise passions without restraint seems a gloomy cloud hanging over my head each time. It's been a while since I last read it; your review and thoughts make me want to go pick it up again! I do love how each time I come to the book, I read it in another light. As a young girl, I think I saw only the romantic, unrequited love between Cathy and Heathcliff. Now of course it's shocking to me that I could have taken only that away - he is such a monster! And Hindley, my goodness. I think I saw his horrific nature in clear and plain view only just the last time I read it. Have you seen the PBS Masterpiece Theatre version of this that came out several years ago? It's very well done, although it does play heavily on the romantic elements, and you see the madness only when Catherine and Heathcliff are separated. Nevertheless, I enjoyed it enough to buy it. :) Again, I quite enjoyed reading your thoughts here, thank you for sharing them.